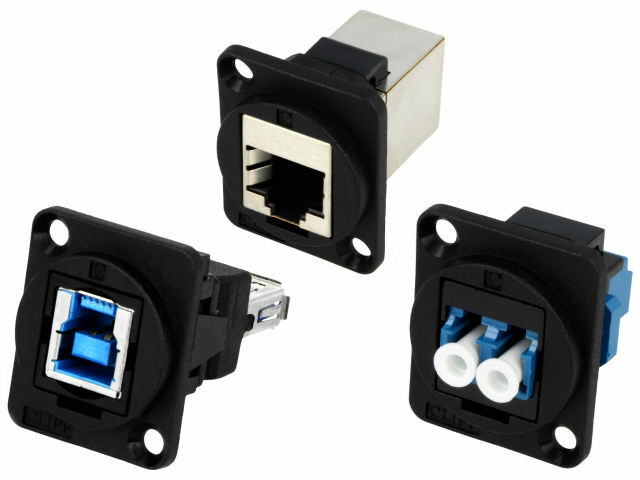 The FT series is a wide range of connectors-adapters for panel installation in standard XLR holes with a diameter of 24 mm and 19x24 mm housing. Available options: USB2.0, USB3.0, HDMI, RJ45 in Cat5 or Cat6, as well as optical SC and LC. Each connector is available in two options. One of them has holes for CSK screws, and the other is designed for plain screws or rivets. They can be installed both on the front and on the back of the panel.